It is with very great pleasure that I have come here today to perform the inauguration of the University of Peshawar. This is a historic day for the people of this province and for Islamia College which has been the center of learning for such a long time and which has played an important part in the creation of the University. The Government and the people of the province can take legitimate pride in their achievement as the inauguration of the University of Peshawar is an important landmark on the road to progress which the province is traversing so rapidly and yet so surely. The University of Peshawar, which started in a borrowed building of the Govt. Training School Peshawar (now Agricultural Training Institute ) in 1950, has now developed into a first rate institution of the country as desired by its founder. Initially, the Department of Mathematics was established in 1928 in Islamia College affiliated with the University of the Punjab. The department was taken over by the University of Peshawar in 1950. The department, since its inception, has been engaged in running M.Sc. programme and has produced graduates who are serving the country in many disciplines. The department launched its M.Phil programme in 1992 whereas Ph.D. programme started in 2001. The department also started BS-4 Years Programme in Mathematics in 2009. In addition to this, the department is running BS-4 year and M.Sc Evening classes. The department's Library is equipped with a modest number of latest books in almost all important branches of mathematics, including some back volumes of International Mathematical Journals. The department possesses its own computing as well as Internet facilities to cater to the needs of the students and faculty members engaged in research. The staff and students in the department can have an early access to large number of books and research journals by using the Digital Library facility extended by HEC under its National Digital Library Programme. The Law college, University of Peshawar is one of the first institutions that started functioning with the foundation of the University of Peshawar in 1950. It was originally envisaged as a separate Faculty of the University and was later on elevated to the prestigious position of an independent Faculty in 1992. With the reorganization of various Faculties of the University, it is now constituent of the newly established Faculty of Social Science. The college is offering both graduate and postgraduate programmes in law. 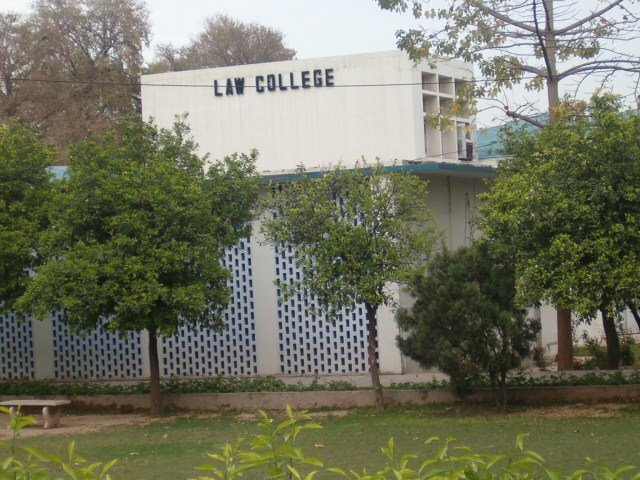 Legal education is generally provided through public sector universities, but confitionallly through if they and also be private institutions that follow the curriculum and standards prescribed by the higher education commission (HEC) in consultation with the Pakistan Bar Council (PBC), a statutory body to regulate legal profession and legal education in Pakistan. The Department of Economics was established in 1950 and is now a well reputed teaching, research, and training institute. Besides the regular M.Sc., M.Phil. & Ph.D degree progrmme, the Department is running BS in Economics Four Years programme leading to MS Economics (11/2 -2 Years Programme) with a view of achieving academic excellence and opening-up new vistas in the field of Economics. The students in the programme are granted admission after passing intermediate or equivalent examination. The Department is also running a Postgraduate Diploma Course in "Industrialization, Trade and Economic Policy". There are also three-months Certificate Courses on "Project Planning and Evaluation", "Applied Econometrics", and "Computer Software Application" taught in the afternoon. The Department has a well-equipped computer lab and a library with over 10,000 books. The Pashto Academy, University of Peshawar is a teaching, research and publication institution. It is situated in the historical valley of Peshawar that has been home to the rich cultural heritage of the Pashtoons. The Academy was established in 1955 at the University of Peshawar due to the untiring efforts of its founder Director Maulana Abdul Qadir who through his academic and administrative skills and potentialities gave a very solid foundation to this unique institution. The main objective of the Academy since its inception has been the promotion and depiction of the Pashtoon social and cultural life. The Academy attracts scholars and researchers from all over the world who have worked and are still working on all aspects of the life of the Pashtoons. 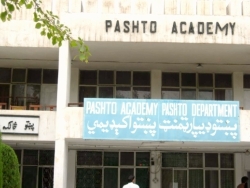 Under the patronage of the Academy the Pashto Department was established in 1961 as a Postgraduate teaching department which is now working as a separate department. 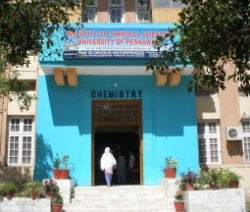 The Institute of Chemical Sciences, University of Peshawar was established in September 1955. Besides catering the academic and research needs of local and national population, the department also receives international students from the Middle East, Africa, Iran and Afghanistan. Initially, the department started with three teachers and eleven students. With the passage of time, the department grew in all dimensions and doctoral program was started in 1970 followed by M.Phil program in 1977. The department is one of the largest postgraduate departments of the University having highly qualified faculty, supported by 25 Para teaching staff. The Department of Physics was established in 1955 and housed in an impressive two story building in the south wing of the science block. It has produced more than 2000 Physics graduates with Master and M.Phil degrees, who are working in different organizations all over the country and in the world. The Department offers specialization programs in Nuclear Physics, Solid State Physics, Electronics and signal processing at master level. The Department of Islamiyat was established six years after the inauguration of the University of Peshawar on October 30, 1950. It has been imparting education on postgraduate level since its inception via regular, private and distance education systems, and has so far produced thousands of Master's degree holders and more than 100 MPhil/PhD scholars who are serving the nation both on national and international levels and are playing a vital role in the nation building. The Department of Persian was established in 1956. It has rendered valuable services in promoting Persian Language and Literature. Apart from the importance of Persian language in strengthening cultural, linguistic and spiritual links with Iran, Afghanistan and other Central Asian Republics, the department has been instrumental in preserving the cultural spiritual values of our country. Besides, M.A. the department offers M.Phil and Ph.D. degree programmes, since 2003. The Department's Seminar Library is one of the richest ones in the University, containing the collection of more than six thousand (6000) books. The Department of Geography, University of Peshawar, was founded in 1956 to cater for the educational requirements of the inhabitants of the province, the adjoining FATA and other nearby areas. It is committed to the mission of quality teaching and research, in the field of the Physical, Human and Applied Geography, under the major themes of man-environment interaction, natural resource management and conservation, application of Technical Geography i.e. Geomatics and Spatial Analysis of various natural and anthropogenic phenomena. The Department has contributed a lot in the initiation of new and emerging disciplines, required to fulfill the need of highly skilled personnel in the region. The Department was established in 1956 with only two students. With the passage of time, the number of students has grown considerably. In addition to master's degree, which is a two year course, the Department also offers MPhil & PhD programmes. The students have their own literary club 'Majlise Adab' to share their literary and creative work with faculty and fellow students. The Department publishes a research journal 'Khayaban'. The Department has the services and contributions of eminent scholars, poets and writers to its credit. The seminar library, rich in content, is being computerized. The Department caters to the needs of national media, education and social sectors in many ways. The Department of Botany was established in 1958 with the late Professor Dr. N.A. Qazilbash as the founder Chairman and the sole teacher to shoulder all the teaching responsibilities. The premier class of M.Sc. Botany consisted of six students who graduated in 1960. The M.Sc. syllabi were revised during 1972, 1976, 1982 and 1999 to bring it at par with the recent developments in the subject to meet the call of the time. Research at M.Sc. level was introduced during 1972, Programme of Ph.D. was initiated during 1975. The present yearly in-take of M.Sc students is 50 each in morning and evening program. M.Phil/Ph.D. scholars are also admitted every year. The graduates are absorbed in education, forest, agriculture, plant protection, PCSIR, ministry of environment and various NGO's. The Department of Geology is one of the leading departments in the field of Earth Sciences in Pakistan both in terms of teaching and academic research. We aim to provide state of the art teaching and research facilities to produce professionally sound graduates at the highest national and international levels of excellence for academic institutions, national and international oil companies and mineral exploration/mining and related organizations. The Department of Geology was established in 1959. Since its establishment, the primary function the Department has been on campus teaching along with research in various fields of Earth Sciences. In view of the importance of Philosophy as a foundational subject, the University administration felt the need to introduce Philosophy at the University of Peshawar. So in 1962, the subject was introduced initially for Honours Degree in Philosophy. In 1963, however, the department was elevated from Honours to Masters level, and ever since the department has been running Post-Graduate courses in Philosophy. In fact, the Department was able to produce its first batch of Twenty-two graduates in 1965. In the year 2000, the Department moved further and developed M.Phil and Ph.D. courses. 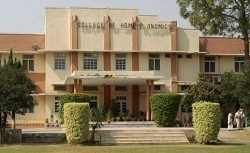 The Quaid-e-Azam College of Commerce (QACC) founded in 1962, is a constituent college of the University of Peshawar. It has a singular honour of having been established out of the funds bequeathed for this purpose by Father of the Nation Quaid-e-Azam Muhammad Ali Jinnah. Mohtarima Fatima Jinnah laid foundation stone of the College on 25th October, 1962. Established in 1962, the Department of Political Science is one of the oldest teaching departments of the University of Peshawar. Political Science deals with the various political, social and cultural arrangements through which people govern their lives. It attempts to interpret the past and explain the present and often dares to draw images of the future. As a field of study, it reaches to many levels from the evolution of political philosophy and the character of contemporary political concepts to the problems of development in emerging nations, from the crisis of governance in Pakistan to the interaction of State, Society and System in the international arena. Political scientists explore the concerns and issues that animate public life. The Department of Psychology came into existence in 1964. Professor Dr. Shahabuddin Muhammad Mughni laid down its foundation as its first Professor and Chairman. The Department moved into the present building in 1973, started PhD programme, and expanded in terms of faculty members, Seminar Library, Laboratory Equipment, and Psychological Tests etc. Under Dr. Jahanzeb's leadership in 2009 a nearby block was occupied by the Department to shift its clinical programme to it. In 2010 Professor Muhammad Jahanzeb Khan won a development project for the department from the HEC and a new academic block was constructed to accommodate Assessment and Counselling Clinic and BS students. The block was inaugurated in April 2016. The College came into existence as a constituent College of the University of Peshawar on 24 July, 1964 through the vision of Chaudhry Mohammad Ali (SPk. ), then the Vice-Chancellor of the University of Peshawar. The College is a living monument of his faith in the emancipation and education of women. Formerly called University College for Women, it was renamed Jinnah College for Women in 1976 to commemorate the founder of the country, Muhammad Ali Jinnah's devotion and his commitment to Islamia College, which turned out to be the cornerstone for the establishment of female education of the University of Peshawar and the birth of constituent educational institutions. Jinnah College for Women is one of the highly esteemed of springs of the University. It shares the motto of the University and has firm faith in the words "Lord, advance me in knowledge". The College has been declared the "Best Institute" for eleven consecutive years by BISE. Students get Presidential Awards, University, FBISE and BISE Peshawar Scholarships every year. Students have been showing outstanding results for the past so many years at both the Intermediate and Bachelors level in Science and Arts. The National Centre of Excellence in Geology (NCEG), University of Peshawar (UoP), is an institution of higher learning and research in geosciences. It was established in 1974 under an act of the parliament. Dr. R.A. Khan Tahirkheli was the founder Director of the Centre. Upon his retirement, Dr. M. Qasim Jan succeeded him in 1988 who was succeeded by Prof. Dr. Syed Hamidullah in January 2001, Dr. M. Asif Khan in 2002 and again by Dr. Syed Hamidullah in 2003. It should be a matter of satisfaction to all concerned that the Centre has been successful in the pursuit of the aims and objectives for which it was established. It has a highly qualified staff with advanced degrees from France, Pakistan, UK and USA. The staff and students have been enthusiastic participants and contributors to national and international conferences, symposia, seminars, and workshops. Several of the faculty members have availed prestigious fellowships, and delivered invited talks in many institutions of Asia, Australia, Europe and America. Three of Centre's scientists have been awarded Civil Awards (Sitara-i-Imtiaz 2, Tamgha-i-Imtiaz 2) Presidential Awards (Izaz-i-Fazeelat 3), Commonwealth Fellowship (2), Fulbright Fellowships (7), Pakistan Academy of Sciences Gold Medals (3), Pakistan Book Council Earth Scientists of the Year Awards (4), as well as Star Laureate and IUCN Environmental awards. Professor R.A.K. Tahirkheli was elected Life-Time Honorary Fellow of the Geological Society, America (1985), while Professor M. Asif Khan was elected Life-Time Honorary Fellow of the Geological Society, London (2008). The department of statistics was established in 1976, and is committed to train students to meet the demand and developing careers in teaching and other government and public sector organizations. The department offers programmes leading to M.Sc., M.Phil. and Ph.D. in statistics. It also offers a postgraduate diploma in Computing and Data Analysis. The department is located in the new faculty building. It has got a well-equipped computer lab with state of the art computing facilities. The seminar library of the department contains a good collection of books and journals on various fields of statistics. The Department of Social Work, University of Peshawar was established in 1976. Initially, it offered two years master programme in Social Work. In 1982-83, two more disciplines namely Anthropology and Sociology were introduced and the department was renamed as the Department of Social Work, Sociology and Anthropology. In 1994, it was bifurcated into the Department of Social Work and Department of Sociology and Anthropology. In 2009, three disciplines (Social Work, Sociology and Gender Studies) were merged as an institute namely the Institute of Social Development Studies which was later on renamed as the Institute of Social Work, Sociology and Gender Studies. In June 2014, the de-merger of the Institute took place and the status of independent departments was reinstated. A Department or an institution to impart knowledge on the Land and People of Central Asia was one of the aims of the University of Peshawar but lack of funds marred its realization for some time. The Education Policy of 1972 made provision for the "Area Study Centre" and the University of Peshawar gave its choice for Central Asia. An Area Study thereafter was established in each University of Pakistan under ACT XVL 1975 of Parliament. The Government of Pakistan, through the University Grants Commission and the Ministry of Education, released funds for the establishment of the Centre at the University of Peshawar. A Sum of Rs. 28, 15,000/- was remitted to the University of Peshawar out of which it established a double storied building on the Campus of the University, housing both the Area Study Centre and Pakistan Study Centre. The Building is situated on road No. 1 of the University at the back of Law College. The Centre has been functioning since April 1978 as a unit academically attached to the University of Peshawar and financially linked to The University Grants Commission. A Board or Governors and Academics Committee, both statutory bodies under the Act, control its administrative and academic performances. The Centre, with grant from the University Grants Commission is gradually equipping itself in teaching and research facilities and is assuming a shape befitting it. It has been publishing a six-monthly Journal (Central Asia) since winter 1978 and enrolls 10 to 15 students each year in its M.Phil and Pd.D courses. The National Center of Excellence in Physical Chemistry, University of Peshawar was established in July 1978 under the Act of Parliament No. XXIV of 1974. It was established with a view to impart higher education and research at M.Phil. and Ph.D levels in the field of Physical Chemistry and related disciplines to promote cooperation in inter-disciplinary subjects with other teaching and research organization and to arrange Seminars, Workshops, Conference and Refresher Courses for the benefits of the young scientists. It is run by the Board of Governor, with Vice-Chancellor, University of Peshawar as the Chairman. The Center has well equipped laboratories and up to date library/ internet facilities. The Center has so produce 220 M.Phil & 100 Ph.D. Scholars about 613 research articles have been published in journals of both National & International repute since inception. On the basis of Performance , the Center was Placed at first Position by MOE and HEC among 24 Center of Excellence all Over Country. The Center has arranged several conference. Recently 11 International Conference in Chemistry was organized by the Center, where Professor from USA, China, Turkey and other countries participated. The Institute of Education & Research (IER) is one of the academic units of the University of Peshawar. Its history goes back to 1920's when Dr. M. Malik floated the idea and felt the need and importance of teacher training, which lead to initiation of its modest start as part of Islamia College offering B.T. (Bachelor of Teaching) course. It was later shifted to Agriculture Training Institute (ATI) and then to the building housing Senate Hall in University of Peshawar. In the early days of the University of Peshawar in 1950 it emerged as Education Department in the existing building in University of Peshawar. Its status was then elevated in 14 October 1963 as College of Education. It was in 1980 when the college was elevated to the level of institute and named as Institute of Education & Research (IER) and placed in the Faculty of Education comprising of eight departments. However, after restructuring of faculties of University of Peshawar it has been placed under the Faculty of Social Sciences. Department of Social Anthropology was established in 1981. The founder and pioneering member of the department was a renowned Professor Karam Ilahi. Currently, the department admits students/scholars to Master (M.A), M. Phil and PhD, in the field of Social Anthropology. The department has a well-furnished library with books covering various topics of anthropology. The department will advertise admission to BS in 2018. Anthropology basically deals with the development processes in a given community. Through integrative approach the knowledge from different branches of anthropology can be used for the solution of human problems. The aim is to improve the qulaity of teaching and research in order to apply the knowledge to practical social problems. It is why students are trained to enable them to work for community development. This is a market oriented subject, hence, the graduate of anthropology are preferably employed in different international and local Non-governmental Organizations (NGOs) and public welfare organizations. The Department of International Relations(IR) was established in 1984 as an independent department within the faculty of Social Sciences, Department of International Relations at University of Peshawar is one of the best departments in its field in Pakistan. The department offers four years Bachelor, two years Masters and M.Phil leading to Ph.D programmes in International Relations. The Department’s significance is multiplied by its location in Peshawar, the point where three strategically very important regions meet, i.e. Central Asia, West Asia and South Asia. The department provides a forward looking and progressive academic environment to students as well as faculty which is engaged in quality research and teaching. The Department of Journalism & Mass Communication, was established in 1985 as a diploma awarding institution. After four years of its working, the department was elevated to postgraduate level in 1988. Till October 2000, the institution was called as The Department of Journalism. Run by a highly professional faculty, the Department has so far produced a large number of graduates, most of whom work in widely-read Urdu, English and Pashto newspapers, besides radio, television, Information Department and other media-related organizations. Since, the Department of Journalism & Mass Communication offers a versatile curriculum, ranging from Mass Communication Theory to English language and Economics, its students get easily oriented in the practical field of Journalism. Currently. The discipline offers courses in mass communication, community journalism, research methods, electronic & print media, advertising & public relations, and cyber journalism. It has a large number of research theises on diverse topics and issues related to Journalism in Pakistan especially KP. A Campus Radio Station (Fm107.4) has already been established, which is producing different programs covering academic and other activities taking place in the university campus and the periphery. The department has recently established a TV lab and plans to start a TV station. Shaykh Zayed Islamic Centres in Pakistan owe their existence to the tireless efforts of the ex-president of UAE and the ruler of Abu Dhabi, His Highness Shaykh Zayed bin Sultan Al Nahyan (1918-2004). Shaykh Zayed Islamic Centre was established in 1985 through the kind and generous help of His highness Shaykh Zayed Bin Sultan Al-Nahyan (Late) who was a great visionary leader and ruler of the United Arab Emirates. Major aims and objectives of this institution are to educate the Muslim youth in the field of Islamic Studies and Arabic language along with modern sciences and technologies such as Computer Science, Philosophy, Sociology, Maths, Economics & Political Science in order to produce moderate enlightened youths for serving the nation and Islamic Ummah. Inspired by such nobel sentiments, the Government of UAE established and equipped three Centres in Pakistan, namely at sultan Lahore, Karachi, and Peshawar. Once constructed, they were handed over the Government of Islamic Republic of Pakistan and handed over to their respective Universities namely: Karachi, Punjab, and Peshawar Universities in 1985. Highness Shaykh Zayed Bin Sultan al Nahyan, the Centres were named after him and are called "Shaykh Zayed Islamic Centres". The Amir of UAE also established a trust for the developmental expenditures of the Centres, while recurring cost is borne by the Federal Government of Pakistan. Our life's demands in the ever growing and fast changing electronic and technological world necessitated preparation of the graduates of the highest caliber equipping them for leadership roles in the specialized discipline of electronics. The age of I.T has put the Electronic on the to be pin technological skills. The need was rightly felt by the top leadership of the University. This all pervasive thought bore fruit resulting in the establishment of the post-graduate department of Electronics in 1988. The department takes pride with profound satisfaction in producing 750 graduates so far. Housed in a spacious building located in the series of mid 20th century's tall buildings of the science faculty, the department is equipped with modern electronics laboratories, well stocked library and enlightened faculty. Pakistan has been facing different environmental problems such as air, water, and soil pollution, overuse of natural resources, deforestation, silting of reservoirs and loss of biodiversity. Humans have ruthlessly used the environmental resources during last decades. The protection of environment from degradation is very essential for sustainable life on the surface of the earth. Natural resource conservation, preservation and management have lately drawn not only the national but international attention as well. The Department of Environmental Planning and Management was established in collaboration with Environment and Urban Affair Division, Government of Pakistan in 1987, at University of Peshawar to cater formal education and research in the filed of Environmental Sciences at postgraduate level. Lately the Department has been renamed as Department of Environmental Sciences (DES) in 2001. Its curricula were improved and new subjects introduced. The University of Peshawar decided to merge the Department of Public and Department of Business Administration in order to have greater synergy into a single entity in 1994. 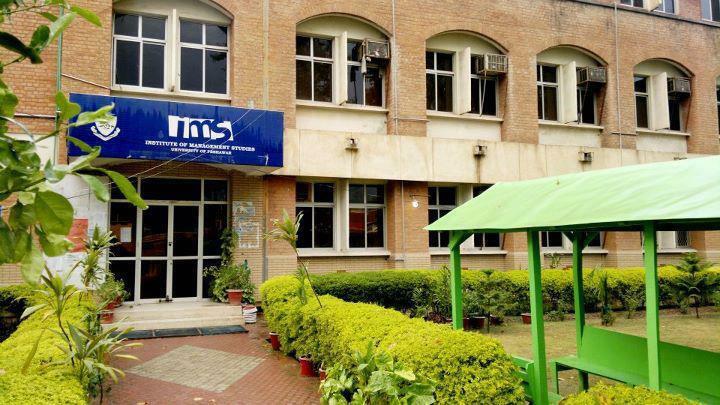 Thus, the Institute of Management Studies (IMS) was formally established in 1995. During the short span of time, IMS developed its own niche in a highly competitive market and established its own reputation among the students, academia, and professional's community. Initially, IMS started Master Programs in Public Administration & Business Administration. However, due to the overwhelming interest and growing demands, the IMS started its Under-Graduate Programs of BBA (Hons). IMS also, offers MBA (18 Months, 36 Credit Hours) program for its BBA (Hons) graduates beside its two year Master Programs in Public & Business Administration. The Centre of Biotechnology was established in April, 2001 by University of Peshawar with the approval of Higher Education Commission (HEC) Islamabad, Pakistan. The first batch of 80 students in Bachelor of Biotechnology and 9 scholars in MPhil in Biotechnology were admitted in November, 2001. Presently, the Centre of Biotechnology is a strategic unit in the Faculty of Life and Environmental Sciences, University of Peshawar. Located in the emerging- sciences building, the institute incorporates both teaching and research facilities, primarily dedicated towards the awareness and development of Biotechnology amongst the masses. The CDPM was formally inaugurated by the worthy Chancellor of the University of Peshawar and the Governor of the Khyber Pakhtunkhwa on April 04, 2009. The CDPM, with the grace of the Almighty Allah, is the first ever centre of its kind in the public sector not only in Pakistan but in the whole of South Asian region. The Centre has been established under the Faculty of Life and Environmental Sciences of the University of Peshawar. The Centre within a record short span of time has to its credit the initiation of multifarious programmes including trainings and workshops for students, managers, practitioners, and administrators to equip them with the knowledge and skills in the field of disaster management. The CDPM has successfully launched the country's first ever One Year Postgraduate Diploma, BS (4 Years), M.Sc, M.S., M.Phil and Ph.D. degree programmes in Disaster Management in Pakistan. The Proposal of creation of the Department of Regional Studies was floated by the Governor Khyber Pakhtoonkhwa in 2009. The establishment of the Department was approved by the Senate of the University of Peshawar in its meeting held in 2010. The meeting was chaired by the Chancellor of the University (Governor Khyber Pakhtoonkhwa). Earlier, the Syndicate of the University had also proposed the creation of this Department in 2009. The Proposal of creation of the Department of Regional Studies was floated by the Governor Khyber Pakhtoonkhwa in 2009. The establishment of the Department was approved by the Senate of the University of Peshawar in its meeting held in 2010. The meeting was chaired by the Chancellor of the University (Governor Khyber Pakhtoonkhwa). Earlier, the Syndicate of the University had also proposed the creation of this Department in 2009. The IPCS founded in late 2014 and it has since embarked on an ambitious agenda. The origin of the institute traces back to the Cabinet decision of Khyber Pakhtunkhwa made on July 20, 2009 which said "A committee, under the chairmanship of Additional Chief Secretary with Secretary Local Government, Law, Higher Education and Establishment Department, was constituted to fine-tune the proposal after receipt of feasibility report from the consultants and submit report to the Cabinet". The Institute started with the seminar entitled "Independence Day Celebrations & Terrorism in Pakistan" Organized by the Dr. Jamil Ahmad on August 18, 2014, however, IPCS was formally opened by the sitting Vice Chancellor Prof. Dr. Muhammad Rasul Jan appointed Dr. Jamil Ahmad as the first Director on September 11, 2014. Criminology as an academic discipline is relatively new in Pakistan. However, it is a popular and respected field of study in many universities of the world. It offers insight into the way criminal justice policies are framed and implemented. More specifically, criminological education focuses on the way criminal justice components operate and deliver justice. Graduates of criminology make professional careers in police, judiciary, prosecution service, prison service, probation system, parole system, and juvenile justice etc. Keeping in view the importance of criminology as an academic discipline, the University of Peshawar has recently started the Department of Criminology at the campus. In addition, the provincial government of Khyber Pakhtunkhwa has also shown interest in the newly established department and has offered all kind of support. A proposal was submitted by the University of Peshawar for the upgradation of the Criminology department which was later on approved by the provincial government. In this proposal, the Department of Criminology will be renamed and upgraded into the Institute of Criminology and Forensic Sciences. The provincial government of Khyber Pakhtunkhwa has already allocated Rs. 200 million for the establishment of the proposed Institute in 2016-17 budget. The University of Peshawar has enrolled the first batch of M.A. Criminology students in the session 2016.